What I love about Green Hat is that she's just so diversely talented! Not only can she write and draw but she plays the piano beautifully and has created some brilliant music for North Castle. Her art is varied with lots of different styles and covering all kinds of characters from not only the games but the cartoon too. 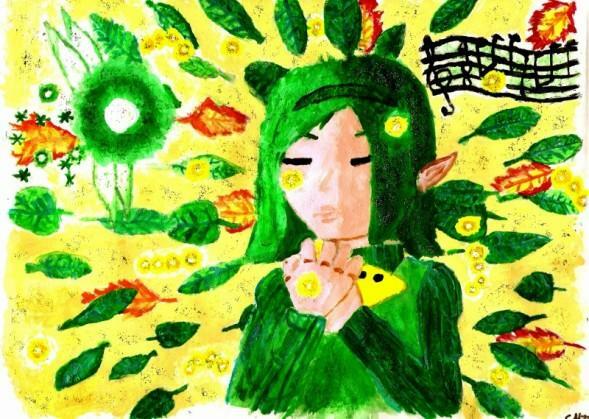 My favourite piece of Green Hat's work is her picture 'Saria Aged 15 coloured'. Finally, I got a GameCube along with the Wind Waker, and then Majora’s Mask for the N64. It’s unfortunate though that I’m a newbe. It would be awesome to play the games that started it all. All of the LoZ games are amazing but, I like the Wind Waker. For some reason the puzzles were very easy to figure out. The music was different from all the other games as well. It was tragic and emotional. Also Linky has some family! The ending credits were a rip off, but at least the music composers made it up for having lovely music. It’s a fantasy/adventure game, which involves puzzles, and quick thinking along with hand-eye coordination. I love games like that because it gives you an excuse to keep playing when your parents say to stop. Just kidding! But seriously, testing your brain a little in a fun way is good. The Zelda music, other people’s artwork and writing. Especially God, because he gave me the talent to remix music, draw and write. Not amazingly…but I’m getting much better. For writing, I love “Saving Termina Once More.” I’m writing it completely on my own and it shows how much I’ve improved since the first chapter. Whoa…I don’t know…Tatl from Majora’s Mask. I made up what she looks like to me and writing about her is so much fun! She actually had personality that people could notice quickly. Unlike Navi and most of the other characters in the older games. Juliet Singleton! She has awesome art and wonderful writing skills. I love her dedication to the old Zelda games. Also, Shannon The Twisted Link Worshipper wrote the most amazing Zelda Romance story ever, “Angels.” Even though it has sexual scenes in it…it’s still amazing! Oh my gosh, and Dark Link, she is SO amazing for writing such a LONG Zelda fanfic! She will defiantly make you a Dark Link fan! I searched for Zelda art on google and found CrazyFreak’s “Link and Zelda” picture. From there I found Zelda fanfiction;‘twas glorious! Haha! Of course, just to FINISH “Saving Termina Once More” and finish this other fanfic, which is a crossover. I won’t say anything else!